Edwin Fox was built in 1853 as a standard Moulemein Trader by William Henry Foster at Sulkeah, Calcutta on the River Hooghly, nearly a hundred miles from the sea in West Bengal. 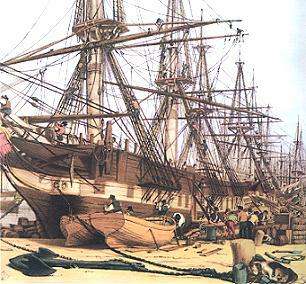 The outmoded design was based on the frigates built at Blackwall on the Thames at London. She was registered as 836 tons, overall length 157 ft., beam 29 ft. 8 ins., draft 21 ft. 6 ins. The vessel was commissioned by merchant Thomas Reeves but was sold on the stocks to Sir George Edmund Hodgkinson of Cornhill, London. He took possession of her on the December 6, 1853. After only a year she was auctioned and bought by shipping mogul Duncan Dunbar who continued to own her until his death when she was once again auctioned off. Dunbar chartered her to the British government to transport troops between Calais and the Baltic and return to Cherbourg during the Crimean War. 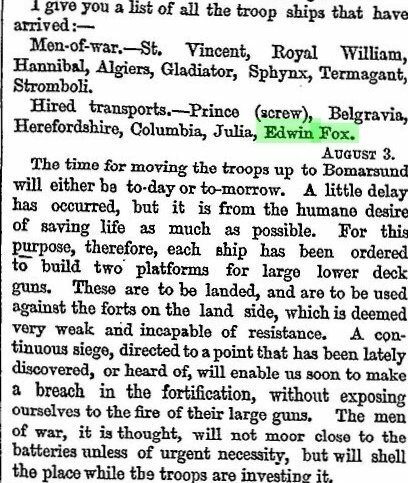 Below can be seen newspaper reports of Edwin Fox carrying troops to the Baltic; carrying supplies of reinforcements, clothing and equipment; transporting troops who were wounded or bound for imprisonment. 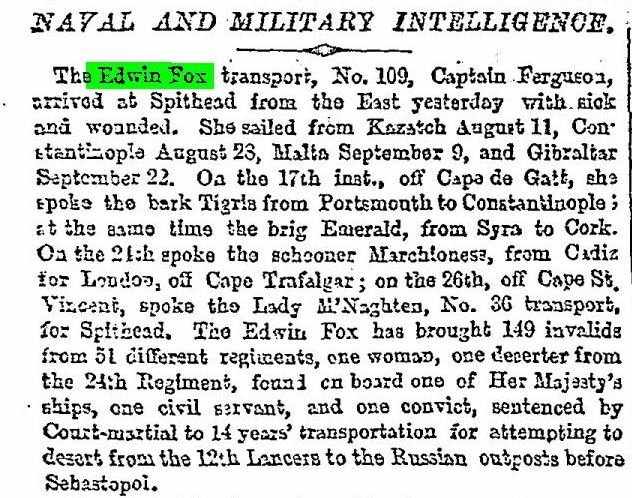 After the fall of Sevastopol Edwin Fox was refitted out to again carry civilian passengers and general cargo. In 1858 she was again chartered by the British Government to transport convicts to Western Australia. She left Plymouth on August 26, 1858 bound for the Swan River Colony. Joseph Ferguson and Samuel Donnelly were the captain and surgeon respectively. She carried the 21st of 37 shipments of male convicts destined for Western Australia. 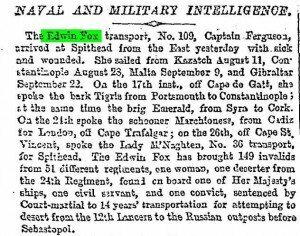 The voyage took 86 days and the Edwin Fox arrived in Fremantle on November 20, 1858 with 82 passengers and 280 convicts. At least six of the convicts were veterans of the Crimean War: Thomas Bushell, Bedford Chapman, James McCormack, James Marsh, Thomas Tipper and William Weir. All had been court martialled for military offences in various parts of the British Empire. Of the 82 passengers mentioned above, 68 were pensioner guards and their families, the number being made up of 30 pensioner guards, 16 wives, 10 sons and 12 daughters. 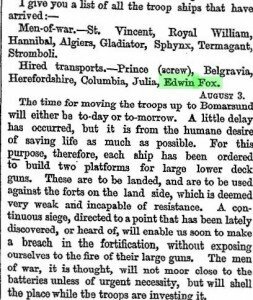 Thereafter Edwin Fox returned to the life of a general trader carrying a range of cargoes from England to India, including ale, according her the nickname ‘Booze Barge’. She then made several voyages as a troopship from England to Bombay. 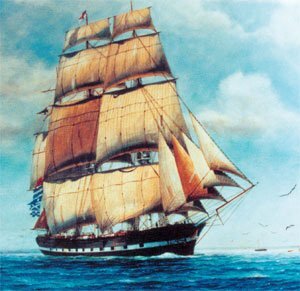 In 1873 she was chartered by the Shaw Savill Company to convey immigrants to New Zealand; she made four voyages carrying a total of 751 passengers. In 1897 Edwin Fox was towed to Picton, NZ where she made herself useful as a freezer ship, a coal hulk and is currently a preservation project and tourist attraction. The New Zealand Maritime Record Website. The Edwin Fox Society Website. Perth Dead Persons Society Website. Newspaper clippings from the Times Newspaper Archives.